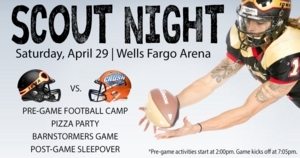 DES MOINES - The Iowa Barnstormers will be hosting their Annual Scout Night Football Camp and Sleepover at Wells Fargo Arena on Saturday, April 29. The Scout Night Package will include pre-game and post-game programming as the Barnstormers face the Colorado Crush. Scout Night will kickoff with a pre-game Football Camp hosted by Barnstormers players on the field at Wells Fargo Arena. The camp will begin at 2:00 p.m. CDT. Following the camp, scouts will head to the main concourse for a pre-game pizza party and have the opportunity to watch the Barnstormers as they warm up for the game. Post-game, scouts will set up camp on the upper level concourse of Wells Fargo Arena and view a movie on the video board before spending the night in the Arena. Scout Night is open to both Cub Scouts and Boy Scouts. Full programming (pre-game and post-game) is available for just $20, while those interested in just the pre-game camp can join for $15. All Scout Night packages include a ticket to the game. Additional tickets are available for family members and friends for just $15. For more information or to register for Scout Night, please contact Juli Pettit in the Iowa Barnstormers front office at (515) 564-8457.